The Model TMF utilizes a flexible tunnel that can be installed quickly around attic obstructions, making it the easiest tubular product to install in the industry. The pitched flashing makes it great for capturing daylight from any roof facing. Tubular skylights, like VELUX SUN TUNNEL skylights, are one green design element that architects are increasingly turning to as an easy and effective way to earn green certification credits for projects. 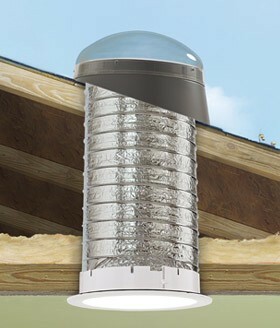 The TMF VELUX SUN TUNNEL skylight comes in a 14" diameter. For more details on the available sizes, please call us at 1-800-900-0759. The standard TMF VELUX SUN TUNNEL skylight kit contains 8' of tunnel for size 014.